In this project, 16 LEDs are used to represent the time in binary. The time is read from a Real Time Clock breakout board - the same one used in the Digital Clock page. The binary clock uses 4 place values for the hour (12hr format), 6 place values for the minutes, and 6 for the seconds. ... makes the time, 8+2 = 10 hours, 16 + 4 + 1 = 21 minutes, 4+2+1 = 7 seconds. Take care with this one, there are a lot of things to get connected. The Arduino isn't shown in this diagram. The text labels show the pin connections - the connections to the shift registers are to digital pins. 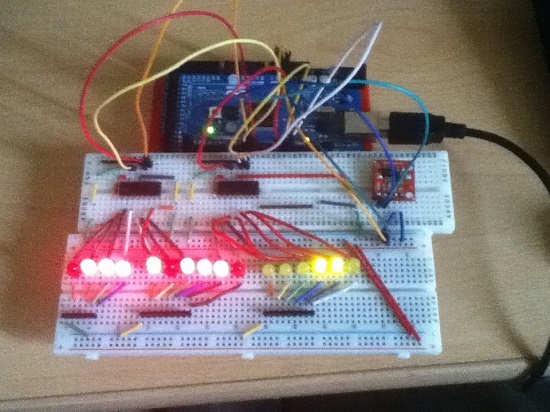 Here is a blurry photograph of the binary clock circuit set up on an Arduino Mega. There are some minor differences to the diagram to account for the differences between the Uno and the Mega. Some of the components (eg resistors) are also slightly different. However, it works just like the one in the diagram. The tricky part of this code is to create the correct binary pattern. The first shift register controls the 4 LEDs that make the hours as well as 4 of the LEDs that make up the minutes. 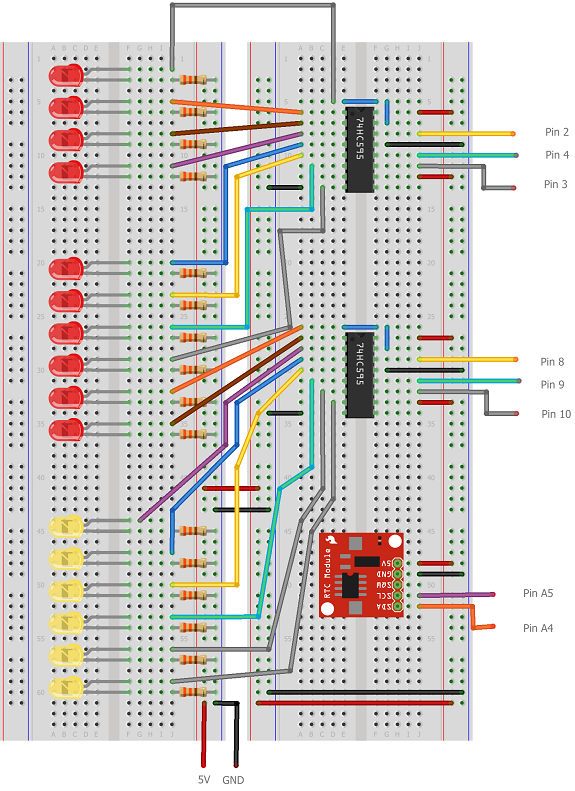 The second shift register does the other 2 LEDs of the minutes as well as all of the seconds. The clock works but it has some missing features and a few flaws. The first is that the RTC does not adjust for clock changes. These happen at predicatable times and could be accounted for in this prototype. It would be useful to be able to set the time on the clock. A couple of push buttons and some nice code and you could set this up. A configurable alarm could be made if you added a Piezo buzzer. The next thing you might consider is the power usage. With the LEDs on all of the time, this project would quickly take all of the power from a battery. That's fine if it's mains-powered but not so good if you want some portability. Adjusting the program so that time is displayed when a pushbutton is pressed would help address this. Finally, this would make an excellent soldering project if you have your own components, a soldering iron and some perfboard.